Looking for quick recipe to enjoy as part of your breakfast? 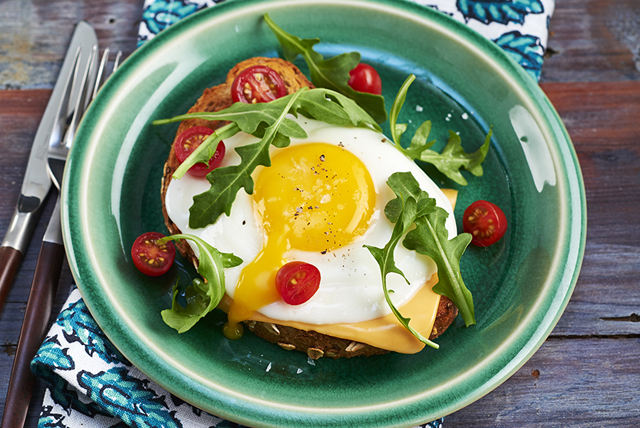 Each tasty Open-Face Cheese and Egg Sandwich features a fried egg, KRAFT SINGLES Light Cheese Slice, baby arugula and grape tomatoes on whole grain toast. Why wait? Try it tomorrow. Melt margarine in large nonstick skillet on medium-low heat. Slip cracked eggs, 1 at a time, into skillet, leaving spaces between eggs; cook 5 min. or until egg whites are set and yolks are cooked to desired doneness. Place 1 toast slice on each of 4 serving plates. Top with Kraft Singles, arugula, tomatoes and eggs.